At the May 23, 2011 regular meeting of the School Board, I voted against acceptance of the latest rendition of the Five Year Forecast, reading this statement into the record. Does that mean that I am opposed to any new levy? No. In fact, I voted in favor of the resolution to put a 6.9 mill Permanent Operating Levy on the May ballot, and voted YES on Issue #7 in this month's election. As we all know, Issue #7 was defeated in an election in which fewer people bothered to vote than we have students in our school district. That doesn't mean the situation is resolved. We have, as a community, allowed the annual spending of our school district to grow well beyond our funding - a situation which is further exacerbated by significant cut backs in State funding. 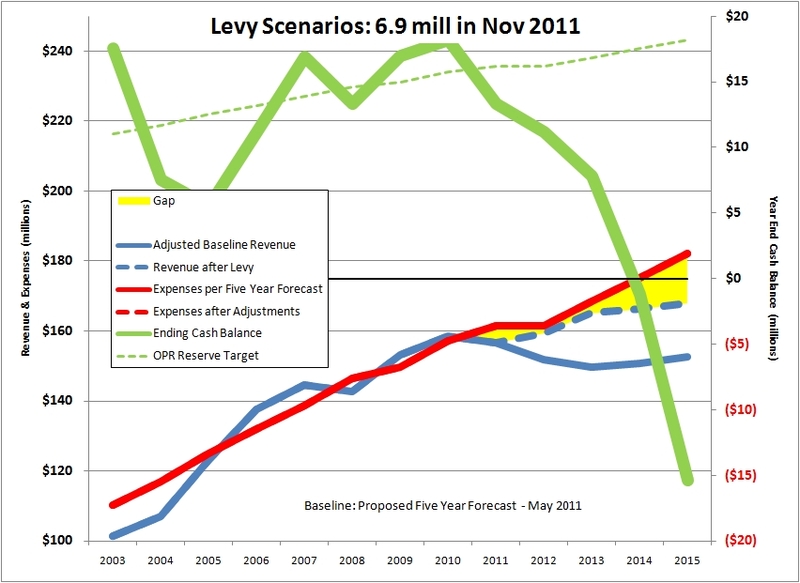 Barring unforeseen circumstances, I am confident that there will be a levy on the November ballot. 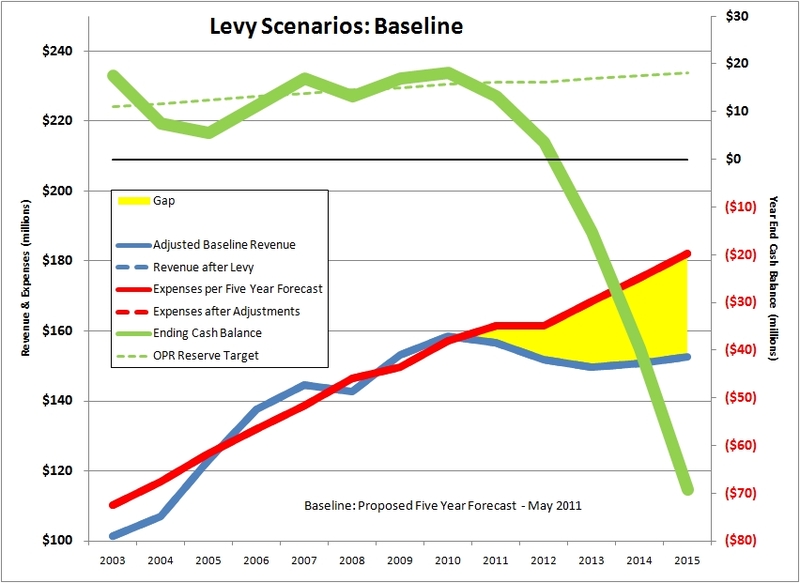 The only questions are the size of the levy, and what gets cut if the levy issue fails. 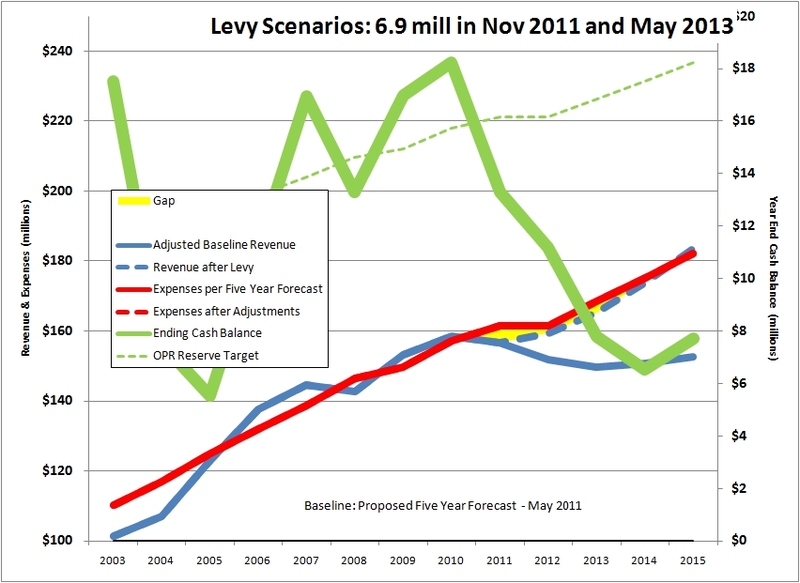 Levy math is pretty simple. 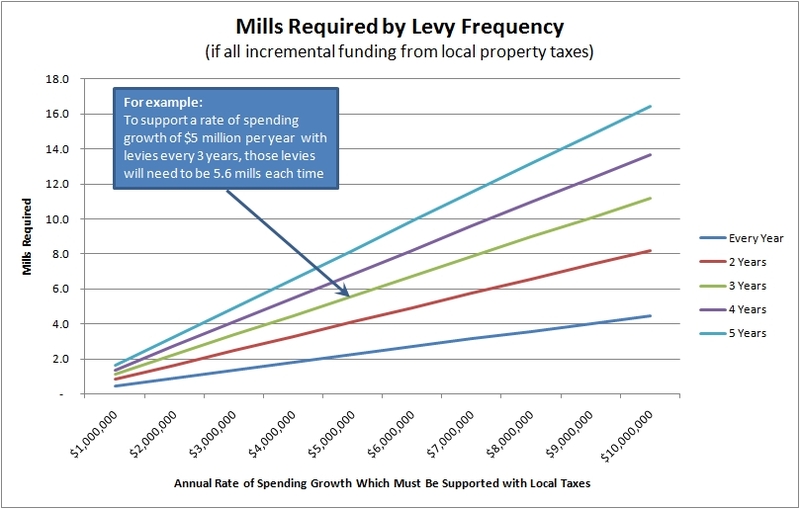 In our school district, we will raise about $2.2 million per year for each new mill of property tax. Last year, 1 mill would have raised $2.4 million/yr, but we are now operating on the assumption that the Franklin County Auditor will be reducing property valuations by about 8% in our community. This means that we now need about 1.09 mills to raise the same amount of money as 1 mill raised last year. As I described in "Budget Knobs," another parameter we need to decide is how often we want to be asking for more money. 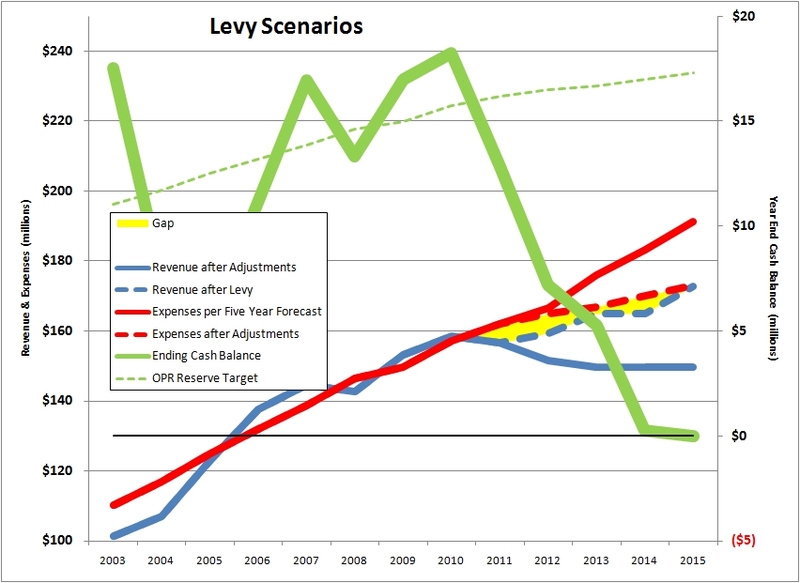 To cover any particular rate of spending increase, the frequency in which new levies are enacted is inversely related to the size of the levy that will be needed. In plain English, the more often a levy is passed, the smaller it can be each time, given any particular rate of spending growth. The reason for looking at such a chart is that I propose that we reverse the way we think about budgeting in our district. The traditional approach is to determine all the new ways in which we're going to spend more money, then propose a levy of whatever size the Board thinks the public will tolerate, and then come back to the community again when that new level of funding is no longer enough. How about if we go at this from the opposite direction? What if we decide how often we are willing to let our property taxes increase, and by how much, and use that to determine the rate in which our spending can grow? Isn't that more like the way we budget in our own households? After all, we don't make up a wish list of all the stuff we want, then go in to our boss' office and say "I've determined all the things I want to do and have, and you're going to have to commit to giving me a 10% raise every two years to support it!" 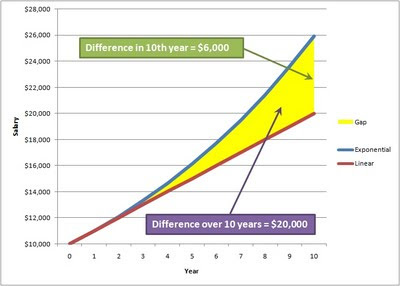 Don't we instead try to make some reasonably conservative projections of future income, and adjust our wants and desires to fit within that projected income stream? Not everyone did of course, instead choosing to finance their unsustainable level of wants and desires by borrowing from credit cards and from the equity on their homes. The current economic situation in our country is caused largely by that behavior. We've done a little of that in our school district as well. We didn't borrow money for daily operations - the law does not permit borrowing to fund current operations unless a school district has been declared to be in Fiscal Emergency by the State. But we did allow our spending to grow in excess of our revenue, in part by using one-time Federal stimulus money to fund current operations, and in part by emptying our rainy day fund. Let's say a person is paid $10,000/yr, just to keep the math simple. Let's also say that the person has an employment contract specifying that the person will receive a 10% salary increase at the beginning of each year for three years. Since 10% of $10,000 is $1,000, that means the increase is $1,000 in the first year, making the new salary $11,000. What about year 2? So if our labor agreements cause compensation costs to rise exponentially, then it would seem that we need to come up with a revenue plan which grows exponentially as well. 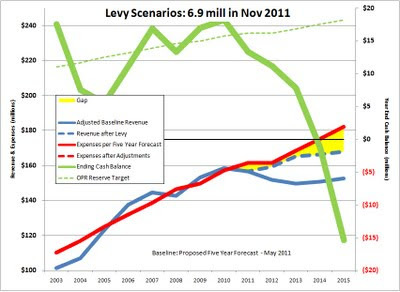 So what now - levies every two years? How long before we get to levies every year? Maybe we need to think about a different approach altogether. Many people believe the Ohio Supreme Court said property taxes are unconstitutional. That lawsuit - Derolph v. State of Ohio claimed that the State funding was insufficient, causing school districts with low property values to either tax themselves excessively, or have underfunded schools. In fact, in one of it's many opinions on this case, the Court noted that property taxes are the most stable means to fund schools. Governments which are dependent on income taxes for revenue are hurting deeply these days, from local towns to the State of Ohio. Conversely, school districts which depend on property taxes - which is our case - have not taken any significant revenue hits in The Great Recession. For many years, school leaders - especially those in affluent districts like ours - have complained that a law enacted in the 70s, commonly called "HB920" prevents property taxes from rising automatically with property values, and that this is the reason school districts had to keep coming back to the voters for more and more levies. As is often true with political statements, this one has some truth to it, but it's not the whole picture. You see, HB920 also prevents property taxes from going down when real estate values tumble, as has happened in the past few years. So when you receive your new property value determination from the Franklin County Auditor later this summer, you'll probably see that the value of your home has been set about 8% lower than it was before. But that won't mean that your property taxes will decrease. And it means the school district won't have to deal with a loss in local revenue. So here is our structural problem: The thing which drives our spending is compensation and benefits, and it rises exponentially. 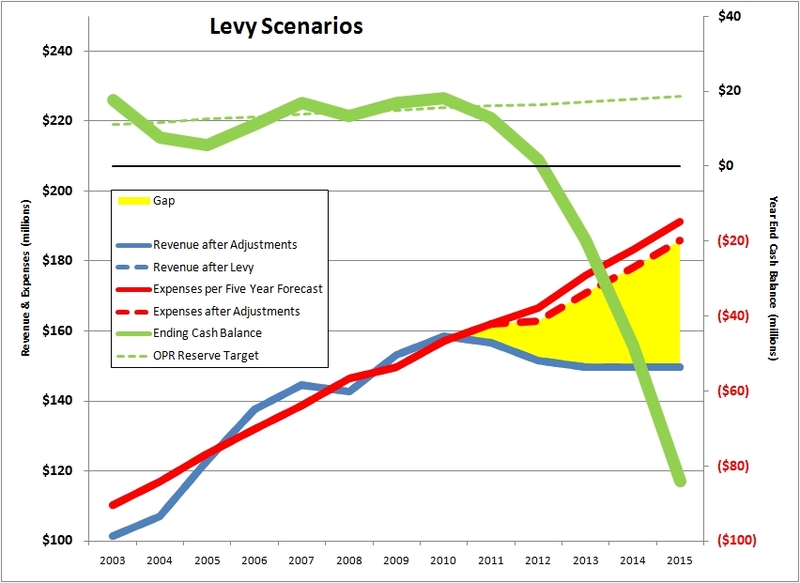 Our local revenue stream - upon which we will increasingly depend for additional funding - is very stable, but changes only upon passage of a new property tax levy. For our property tax revenue stream to grow exponentially, levy issues have to passed in exponentially larger sizes (not likely), and/or the frequency of levy issues has to increase exponentially (what's more frequent than every year?). However, there is another tool available to us: Ohio law permits communities to impose school income taxes. Approximately 30% of all school districts in Ohio currently impose income taxes, collecting from a low of $3.01 per student in Zane Trace Local Schools (Ross County) to $3,091/student in Oberlin City Schools (Lorain County). For those districts with school income taxes, the average and median income tax collected per student is about $1,000. It should be noted that districts with high school income tax rates, like Oberlin, tend to have much lower property tax rates. The high dependence on school income taxes would expose them to the same revenue risks as municipal government, although it should be noted that Oberlin is a community built around a college, which tends to make incomes more stable. One more point deserving mention: Ohio law allows school districts to base income taxes on all income, just 'earned income' or a combination of both. The option of 'earned income' taxes came about to allow school districts to excuse those who have little or no earned income, notably senior citizens who tend to be living on pensions, retirements savings and Social Security (disclosure: I'm one of these people, so an earned income tax would be very beneficial to me). Politically, these levies tend to be much easier to pass, as senior citizens are much more likely to vote than the general population, and earned income taxes are an easy sell to them. So is there a place for school income taxes in our school district? Since nearly all of our tax dollars are used to pay for the salaries and benefits of our district's employees, if we can negotiate labor agreements which are coupled to community income, a revenue stream derived from community income should automatically track funding needs, and significantly reduce if not eliminate the need for future property tax levies. Likewise, if our incomes go down, the amount of tax we have to pay diminishes as well. We can't be 'taxed out of our homes' in this case. But it means it is crucial that the labor agreements with the school employees have automatic adjustment clauses that reduce compensation commensurate with the revenue loss. Otherwise the loss of revenue will require layoffs to bring the spending back into alignment with the reduced revenue flow. When our incomes go up, the amount of school taxes collected will increase correspondingly, without the need for a property tax levy vote (school leaders typically view this as a PRO). Without the need for a property tax levy vote, there will be a diminished need for the School Board and Administration to be accountable to the community. I personally like that we have that accountability today. I'm beginning to think that a mixture of property tax levies and income taxes might be the best way to go. We would pass property tax levies of a reasonable size (e.g. 3 - 4 mills) every 5 years or so to provide a stable funding base. On top of that base, we would use income taxes to provide a revenue stream which changes with the state of the local economy. The fiscal strategy we've been using for many years to operate our school districts just isn't going to work going forward. The compensation mechanism is no longer compatible with the funding realities. We need to look at new structures for both. And we're running out of time to act. At the School Board meeting on Monday, May 23, 2011, Treasurer Brian Wilson will be presenting an update to the Five Year Forecast, which is prepared and submitted to the State Board of Education by all school districts in Ohio. A copy of what will be presented is available here. 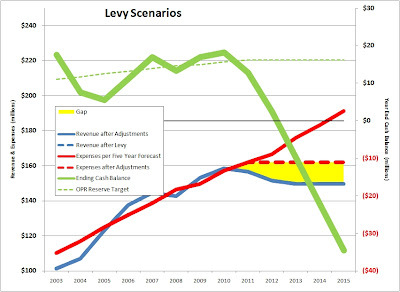 ... in which I tried to estimate the impacts of the state funding cuts and the spending reductions enacted after failure of the levy. So my numbers were pretty close to the Treasurer's. 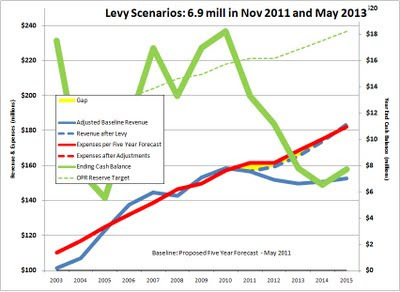 And it means we still have a problem: The forecasted spending trajectory remains unsustainable. That's not just my opinion: The district's Audit & Accountability Committee used this word multiple times in their June 16, 2010 report to the School Board. In other words, this spending trajectory requires levies on the order of 7 mills every 2 years, if there is no further erosion of state funding. And even this is well short of the funding needed to restore the 10% cash reserve balance which is the policy of this School Board. 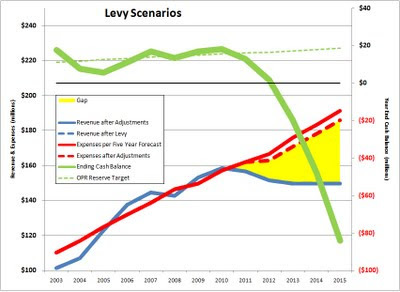 The "stretching of the levy" was not so much due to aggressive expense management as it was getting the benefit of one-time Federal Stimulus money, as well as emptying the piggy bank, a point I first made in December 2009. So if raising our property taxes by 7 mills every two years isn't sustainable, what is? Between 2003 and 2011, our rate of spending growth was essentially linear, at a pace of $6.4 million per year. This Five Year Forecast suggests that, after a one-year spending freeze between FY11 and FY12 (as a result of the cuts now being enacted), we increase the rate of year to year spending growth to $6.9 million. Of that $6.9 million/yr increase in spending, $6.7 million/yr (97%) would be applied to compensation and benefits. I am not now, nor have I ever advocated absolute spending cuts. I believe that we want to retain as much of our current programming as we can afford, and also be able to grant reasonable pay increases to our outstanding team of teachers, administrators and staff. However, we have to reduce the pace of spending growth - at least until we have a significant rebound in our economy. This still doesn't leave us with a lot of cash reserves. Once we've spent the money in the piggy bank, putting it back requires setting aside some of our income for that purpose, and not spending it on programming and compensation. So how do we take $2.9 million/year out of our rate of spending growth? It certainly won't be easy, and I'll suggest that there can be no 'sacred cows' that are untouchable. As a community, we'll need to prioritize what is important to us, and then make the hard decisions as to what programming will make the cut. We'll also have to have a respectful and empathetic conversation with the teachers and staff to see if they are willing to explore ways to adjust their compensation and benefits structure in a way that helps preserve as much programming as possible. I've made a proposal to the Board as to how we, as a community, might go about making these decisions. This proposal is meant to be a discussion starter, as I'm sure there are other processes that could be used to tackle this issue - I'd argue one of the most important issues facing our community. But we need to pick one - and soon. 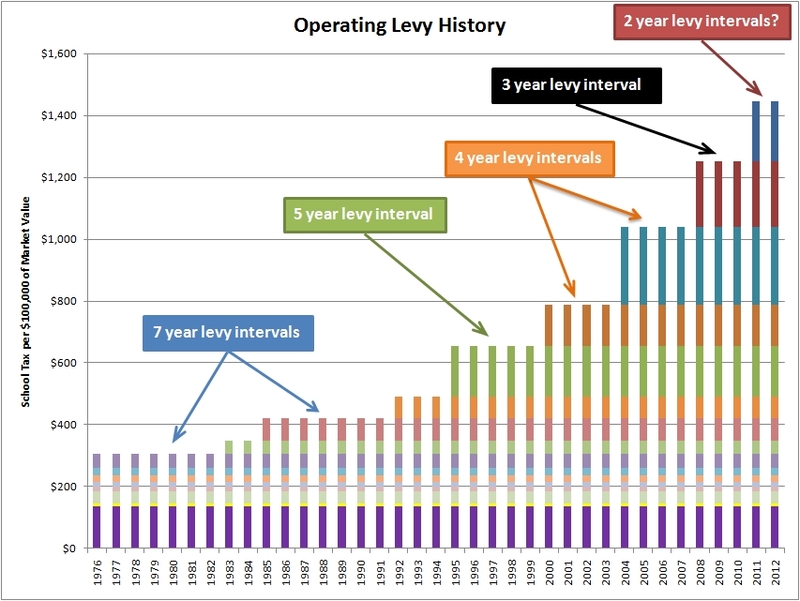 As of this writing, we have 80 days remaining to make a decision whether or not a levy will be on the November ballot, and how large it will be. I've corrected the calculations in the illustration below. My apologies for the bad assumption on the number of middle school basketball teams. Thanks for pointing out my error. As on prior charts I've presented, the yellow region depicts the difference between revenue and spending, and it remains pretty substantial. It means that the things that were on this cut list are just a tiny start unless we figure out another way to align spending with revenue. 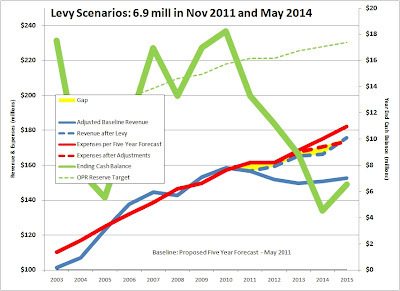 And we don't have a lot of time: the green line depicts the projected cash balance, and you'll note that it goes negative in FY13. That can't be allowed to happen. But even this tiny start creates pain. In my short time on the Board, no issue has drawn more public input than these cuts to Gifted Programming and Middle School extracurriculars. While it's disappointing that there is little engagement in the community until a decision is made that someone doesn't like, I nonetheless appreciate that many people have come forward on this issue. It's also helpful that many of the complaints have been accompanied by alternative solutions. In particular, of the many emails sent to the School Board about middle school athletics, a number have included the suggestion that sports - and I suppose other middle school extracurriculars - be funded with a Pay-to-Play approach. I have concerns about Pay-to-Play, and I thought it would be appropriate to explain them to you. It's not that I don't value extracurricular activities. My wife and I both participated in extracurricular activities in high school, and in fact we met in one (marching band). Our children took advantage of our school district's fantastic programs as well, and we were proud to watch them perform in exemplary organizations. My concern is that a Pay-to-Play approach could exclude some kids from participating in these activities because their families cannot afford the fees. We're running a PUBLIC school district here. America didn't always have public schools. Our Founders came from affluent families who could afford to send their male children to private schools and private tutors. But along the way, we as a society decided that we should have public schools available to all children regardless of gender, ethnicity, religious beliefs, and financial wherewithal, to be funded by taxes levied on all members of a community according to one's wealth. I think most of us would argue that this has been a good thing for our country. Those offerings on the second floor are held up by the resources spent on the foundation of the building, and the structure of the first floor. Without this supporting structure, the offerings on the second floor would be much more expensive. In fact, they would have to stand alone. That's what a club sport is to me. It's fully supported by its members and sponsors, without the benefit of taxpayer money. The club can pick and choose who are its members, what they spend to run the program, and what kinds of facilities they will use. But it's not appropriate, I feel, to operate what amounts to a private club within a public school, taking advantage of some taxpayer-funded resources, but causing some kids to be excluded because they lack the ability to pay the fees. That doesn't mean there is no solution acceptable to me. Some have said that they would be willing to pay extra to create a financial assistance program for kids who want to participate in an activity, but can't afford it. I'm not sure how you would go about determining if a kid qualifies for such assistance. But this seems like a reasonable idea, meriting some consideration. We could say that a kid qualifies for Pay-to-Play assistance if he/she has been placed in the category of "Economically Disadvantaged" as is used by the state and federal government. Using data from the last State Report Cards, we had 2,375 kids enrolled in our three middle schools, and 22% - not an insignificant number - of them were designated as Economically Disadvantaged. Let's go on to presume that the number of kids interested in participating in middle school extracurricular activities are in the same proportion. Pick a sport - say middle school boys and girls basketball. According to numbers I have from last year regarding supplemental salaries, we have a total of 12 coaches assigned to 6 12 teams being paid in total $32,000 in supplemental salaries (in addition to their compensation as teachers). I know there are other costs associated with running the middle school basketball program, but for this thought exercise, let's consider only the supplemental salaries for the coaches. Assuming that ten 13 players make each team, that's a total of 60 156 players. So if you divide $32,000 by 60 156, you get $535 $205 per player. But if you assume that 22% of those players, about 13 34, are also economically disadvantaged and should be allowed to play for free, with the cost distributed over the other 78% of the players, then the cost per player jumps to $686 $263. That's not the only possible solution of course. Some have mentioned seeking outside sponsorship. So the per-player fee could be kept at $535 $205 if about $7,000 in sponsorship money could be raised - enough to fund the 13 kids who are economically disadvantaged. That seems plausible to me. The cost of a sport is also offset by the revenue generated by ticket sales. This can be a big number for some sports (football, basketball, gymnastics), and not so much for others (golf, cross country). So there might have to be some discussion about revenue sharing amongst sports. Again, I stand by my conviction that a public school system is obligated to offer programming to all regardless of the ability to pay. I have spoken out against the extra academic fees charged, as well as the fact that we exclude kids from things like the annual 8th grade trip to Washington DC. But I'm open to solutions that achieve the same result - opportunity according to ability and passion, not economic status. "Regardless of how you voted for the Hilliard School Levy, here is something to think about. We have 15,634 students in the district and there were 14,488 votes cast. That's less than 1 parent per student that bothered to vote. Sad"
The greatest danger to our school district, and therefore our community (and arguably our county) is the ignorance of and lack of critical thinking by the majority of citizens in regard to the core issues, as well as the general lack of interest in getting engaged in developing solutions. Sure, plenty of people get involved in booster organizations and PTOs, and that's wonderful. But when it come to governance of the school district, the number of people who have shown interest over the years is relatively tiny compared to the population. To those who wanted this levy defeated - there is no victory here. The hard work is yet to come. You can't just say NO - you have to help answer the "Now What?" questions. Not in generalities - in specifics. What needs to be our spending priorities? What should get less funding so that other things can get more? If you advocate pay cuts as a way to balance the budget (rather than layoffs and programming cuts), how do you propose making that happen and not ignite a labor conflict? And for those who campaigned for this levy, first I appreciate your service to the community. But let me suggest that the "it's for the kids" rhetoric needs to end. It's not. It's a dialog between one set of adults who want more and another set of adults willing to give less, and the kids get caught in the crossfire. Shame on all of us. Our costs are driven by compensation and benefits. 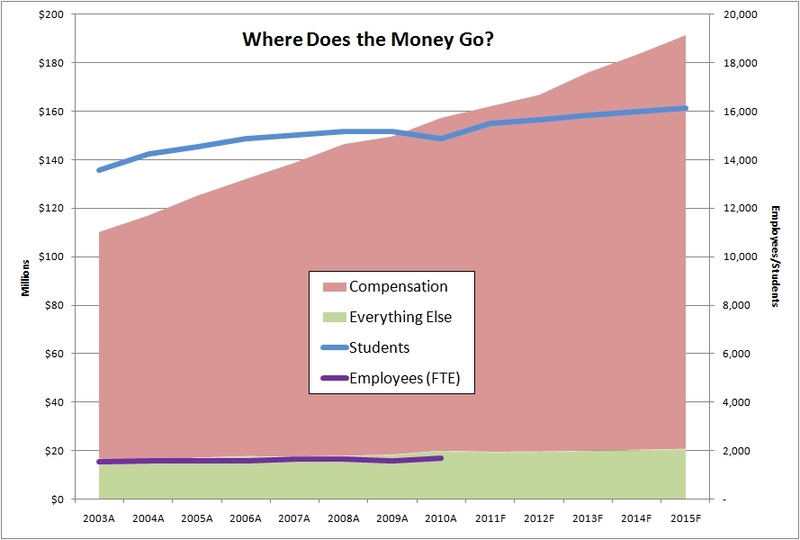 The current spending trajectory is unsustainable given reasonable expectations of revenue, and that means we need to have a respectful but tough conversation about compensation and benefits. It's not about busing, middle school extracurriculars, gifted programming or anything else that gets put on these 'cut lists.' It's time we addressed the real cost driver. Unless and until there is an economic renaissance in Ohio, the state government is going to keep taking money away from school districts they perceive to be affluent - like ours - and redirect it to other districts they perceive to need the money more. It doesn't matter which political party controls the Governor's office and the General Assembly, there's only so much money, and our share of it is going to continue to shrink unless the suburbs find a way to counter this political reality (e.g. Superintendent Dale McVey currently serves in a top leadership position for an association of school districts similar to ours across the state - an association which lobbies on our behalf to state lawmakers). One of the best ways to ease the tax burden on the residents and businesses in our school district is to recruit more businesses to set up shop here. I'm encouraged that Nathan Painter was the top vote getter in the Hilliard City Council primary, which all but guarantees him a seat on Council in the General Election this November. As a charter member of the school district's Audit & Accountability Committee, he understands these dynamics, and I'll trust that he will make win-win decisions for both the City and the School District. Let's treat the people of our community like grownups, and give them the information they need to help find solutions, not engage in emotional warfare. Let's build an effective community education program, as I've been harping about for years. Education is the business we're in, isn't it? So let's teach the people how this stuff works. Olentangy schools built an impressive community education program (I attended a few of their sessions), structured so as to provide continuing education credit to their teachers as well, which encouraged their participation. Maybe we can borrow their template. And people of the community, if you want things to change, then engage in the process rather than armchair quarterback those who do. Find out how things really work, and quit believing all the urban legends. And by all means -- VOTE! Notice is hereby given; there will be a SPECIAL meeting of the Board of Education of the Hilliard City School District on SATURDAY, MAY 7, 2011 from 9:00 A.M. until 10:30 A.M. located at Hilliard City Schools Administration Annex, 5323 Scioto Darby Road, Hilliard, Ohio. The meeting will be informal conversation in which community members are invited to sit down with board members in a casual setting to share ideas, express concerns or ask questions concerning the school district and no further business will be transacted. One of the lessons learned when studying engineering is that 90% of the work is in framing the problem. The math and physics are pretty straightforward once the question is appropriately defined. 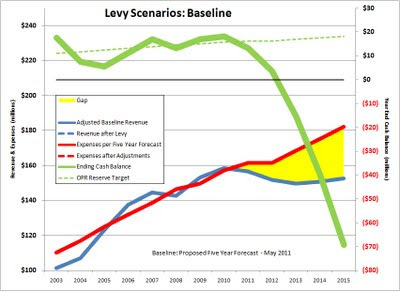 This has been my challenge with deciding how I would vote on the levy - framing the question. The question is not about my personal ability to afford a tax increase, although I'll tell you that this economy has had a significant impact on our retirement income. The tax increase associated with this levy would not go unfelt in our household. I am certainly concerned about the impact of additional taxes on the most vulnerable in our community - those on fixed incomes and those who have lost employment - and expressed this concern during a recent School Board meeting. From the perspective of the public entity - the school district in this case - property taxes are an excellent funding mechanism because they tend to remain constant regardless of the state of the economy. But from the perspective of a taxpayers, property taxes can be a nightmare because they remain constant even when one's income falls. Even the Federal government gives you a break on taxes when you lose you job. But property tax bills keep on coming regardless. I am not swayed by the claims that the district cut spending by $6.5 million. Spending has gone up year after year at an annual growth rate of 4.7%, almostly entirely due to increasing spending on compensation and benefits. I'm not saying that this is good or bad. It's just the truth. Nor is this levy being driven by an increase in the number of of students, or even the number of employees, as you can see from this chart. When the last levy was passed in 2008, the student enrollment was 15,150. This grew to 15,487 by the end of 2010, an increase of 337 students or 2.2%. In the same period, spending rose from $146.4 million to $157.2 million, an increase of $10.85 million, or 7.4% - more than three times the rate of student growth. It troubles me that there is no mention in the levy campaign literature as to the opinions expressed by the Audit & Accountability Committee, a team of highly educated and experienced business professionals who were recruited to serve as the independent voice of our community in regard to the fiscal management of our school district. The formation of this committee was one of the commitments made during the last levy campaign. Now it is as though the Audit & Accountability Committee doesn't exist - at the very time when one would think the levy campaign team and the district leadership would want to tout the Committee's findings. But their findings weren't that rosy - calling our current rate of spending growth "unsustainable." I am also deeply troubled by what I feel is inadequate strategic planning by the School Board and the executive management of the District. Without question, the 2020 Plan is an impressive compilation of many elements of a strategic plan. But it lacks the fiscal component. The programming it describes is wonderful, but how much will it cost, and how will we pay for it? Those answers should be well known by the leadership and the people of our community when this enterprise consumes over $160 million per year of our tax dollars. I have been saying for a long time that the state is going to expect affluent districts to carry more and more of their own funding burden. 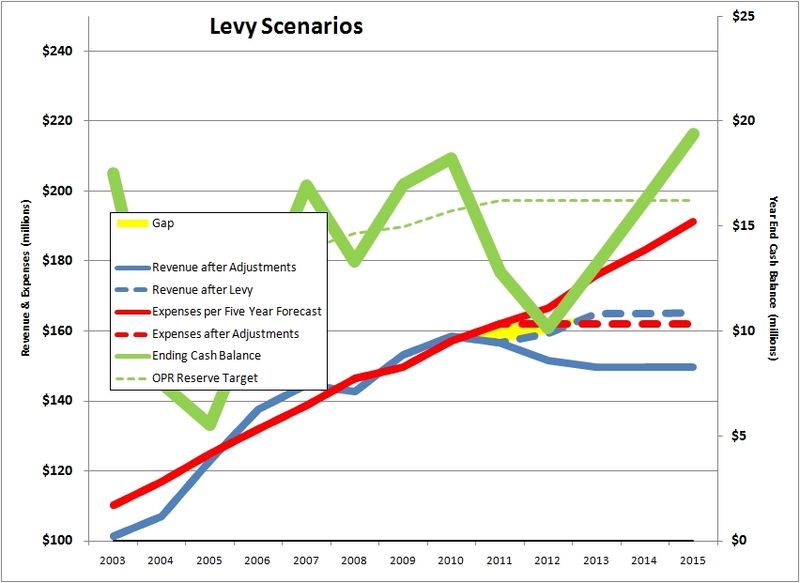 The Dispatch has just analyzed the latest rendition of the State budget, and reports that this easy-to-make prediction is now a painful reality. Notice that the adjusted revenue and spending lines are nearly coincident in the chart above. 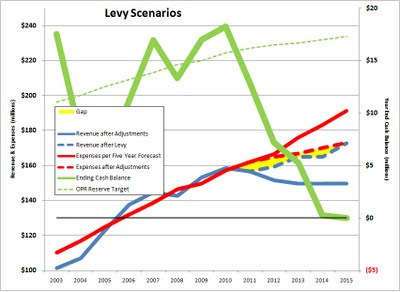 In fact, the revenue line is about $3 million per year higher than the spending line, which is why the cash balance slowly builds in this scenario. 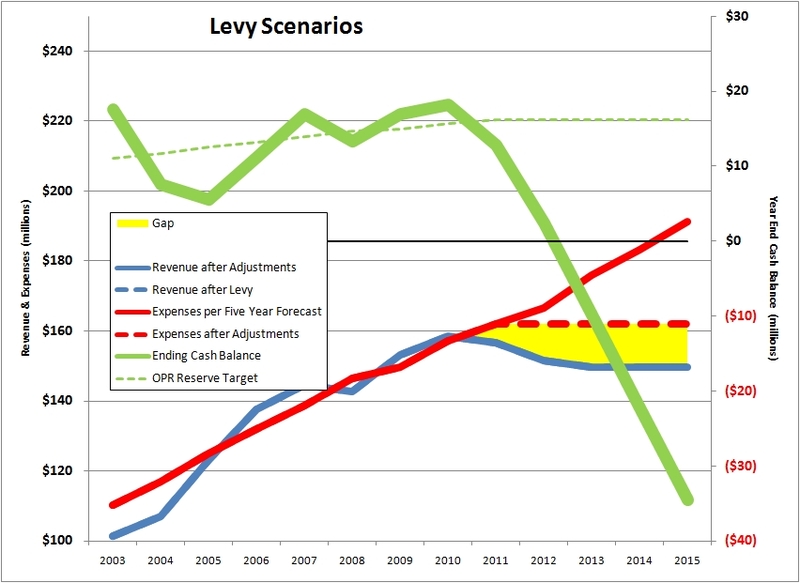 If expenses were frozen at FY11 levels, it would take a levy of about 5.5 mills to exactly match the revenue with current spending. That's not all due to the state funding cutbacks - we will end FY11 with a spending deficit of approximately $5 million - driven mostly by rising compensation costs (see "Budget Costs"). That's equal to about 2 mills. So 2 mills are on us, 3.5 mills are on the State. Therefore, 6.9 mills covers our current deficit, covers the cuts in State funding, and starts to generate a little surplus at current spending levels. 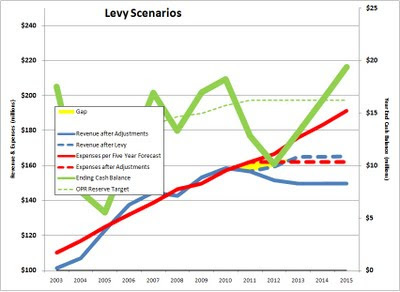 If this levy is passed, do I trust the Board, Administration, Teachers and Staff to work together and with the Community to build an operating plan which has spending growing at a rate of no more than 1.8% per year, which is the maximum rate at which spending can be allowed to grow and not have another 7 mill levy on the ballot before 2014 - three years from now (as depicted in the graph below)? I have to believe that we, as a community, can and must find a way to both preserve the excellence of Hilliard City Schools and reduce our rate of spending growth to 1.8% per year, down from the 4.7% annual growth rate in which we have indulged ourselves over the past several years. That goal is why I ran for the School Board, and I believe that's why you elected me. For me to vote NO on this levy means to admit defeat: that I don't believe we can find a way to work together over the next few months to reach such a goal, and that the only way to restore sustainable economics is to compel the leadership of the District - by withholding additional funding through a string of levy defeats - to cut programs and lay off a great number of teachers, administrators and staff (approximately 100 by my calculations). Or to try to negotiate significant pay cuts - on the order of 6% - and to freeze compensation at that level for several more years. So it's really a matter of trust. Do you trust that this School Board and Administration will work hard this year, in partnership with the employee unions and the community, to begin restoring sustainable economics to our District? If so, then a YES vote is warranted. However, if that trust is not there, then I understand a NO vote on this levy. But that's not the end of your responsibility. You need to explain your wishes and ideas to the School Board, and participate in the process of putting things on a new course, whatever that may be. That certainly includes playing your part in deciding who should represent you on the School Board when two seats come up for election this November.